CAMARILLO, Calif., August 9, 2018 – Semtech Corporation (Nasdaq: SMTC), a leading supplier of high performance analog and mixed-signal semiconductors and advanced algorithms, announced collaboration with HEX SAFETY (HEX), a leading smart fire prevention company in Taiwan, to incorporate Semtech’s LoRa® devices and wireless radio frequency technology (LoRa Technology) into its Dynamic Evacuation System. 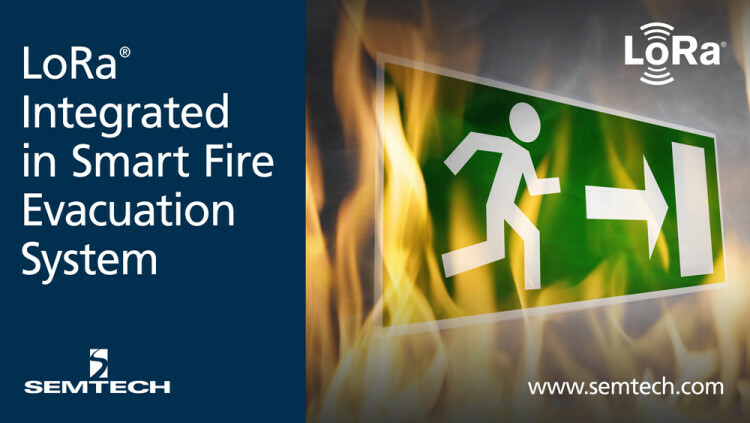 HEX’s Dynamic Exit Signs integrated with LoRa Technology intuitively help people navigate complex hazardous zones in real-time by indicating the quickest and safest direction out of the premises. The conventional exit signs only signal where the closest exit is, which may mistakenly lead people into hazard zones. The HEX Dynamic Evacuation System communicates with the building’s existing fire alarm system and sends the safest direction to every HEX exit sign in the building. By enhancing people’s decision making and shortening the egress route, the HEX Dynamic Evacuation System significantly increases chances of survival. Since power outages are common during a fire, LoRa Technology provides the long range and low power capabilities in an IoT platform that is needed for operating HEX’s exits signs. HEX SAFETY, INC. is the pioneer supplier of the Dynamic Evacuation System which brings technology into the fire prevention industry. HEX has focused on the research and development of the Dynamic Evacuation System since 2011. HEX’s Dynamic System is the first intelligent fire equipment which was approved by the Fire-Fighting Alliance in Taiwan and became a certified B Corporation. For more information, visit https://www.hexsave.com/. All statements contained herein that are not statements of historical fact, including statements that use the words “hope,” “could,” “ideal for,” “designed to,” or other similar words or expressions, that describe Semtech Corporation’s or its management’s future plans, objectives or goals are “forward-looking statements” and are made pursuant to the Safe-Harbor provisions of the Private Securities Litigation Reform Act of 1995, as amended. Such forward-looking statements involve known and unknown risks, uncertainties and other factors that could cause the actual results of Semtech Corporation to be materially different from the historical results and/or from any future results or outcomes expressed or implied by such forward-looking statements. Such factors are further addressed in Semtech Corporation’s annual and quarterly reports, and in other documents or reports, filed with the Securities and Exchange Commission (www.sec.gov) including, without limitation, information under the captions “Management’s Discussion and Analysis of Financial Condition and Results of Operations” and “Risk Factors.” Semtech Corporation assumes no obligation to update any forward-looking statements in order to reflect events or circumstances that may arise after the date of this release, except as required by law.